Think it's too late for tackling those home clean out or renovation projects? Winter is actually a great time to re-do your kitchen, remodel the bathroom, and (or) clean out that clutter-filled basement. Start the New Year off right with a fresh look and a clean slate! Just think of how many holiday calories you could burn off while simultaneously losing excess baggage around the house. A lot of people tackle their projects in the summer when the weather is nice and motivation is at its peak. But, that's also the busiest time for dumpster rental companies. That means there's greater availability come the winter months. Chances of getting a dumpster delivered to perfectly match your schedule or even the same day you call, are at their highest! 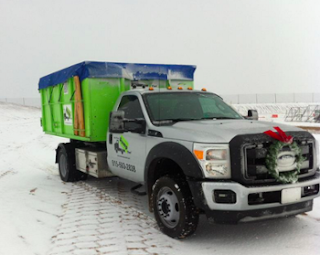 At Bin There Dump That, we're pros at bin placement, in almost any weather condition. Our driveway protection guarantee includes protective boards that are carefully placed on the driveway before the bin ever touches the ground. This provides a stable and sturdy foundation for our bins, even on slippery driveways. Our bins are residential friendly. This means that they can be placed conveniently close to your house or snug next to where your project is located. So if it snows a few inches before our arrival, please grab a shovel and clear a space for the bin. If it starts snowing heavily while the dumpster is in your driveway, you might want to toss a tarp over the top to keep the snow from adding up inside. Usually, any accumulated snow will melt, and the water will pour out when the dumpster tilts for emptying. But melted snow in your dumpster can make some items waterlogged and heavy. You don't want to pay more than you have to, and neither do we. Rarely do we cancel a bin delivery due to bad weather. Our trucks are not only residential friendly, but well equipped for the elements. Back in December, 2013, a massive ice storm devastated greater Toronto. Utility poles and tree branches collapsed under the weight of the thick ice accumulation. More than 300,000 homes were without power. Trees toppled onto houses all over the city. Ice covered everything. There was a huge need for dumpsters to help in the cleanup of fallen branches, damaged roofing and siding. Bin There Dump That operators answered the calls, despite the storm. If you are planning on toting items out to your driveway this winter to toss in the dumpster, be careful out there. It's tricky enough navigating a slick driveway empty handed. If you're carrying an old couch or an armload of items, it's even trickier. Make sure you have a clear path shoveled out for yourself. Spread some de-icer on your pavement to help melt down any slick surfaces. And lastly, be cautious when walking. We want all of our customers to have a safe and stress-free experience with us! Time To Tackle That Winter Project? Reserve A Bin! Bin There Dump That operators are happy to deliver a residential friendly bin right to your driveway, even in lousy weather. The bin will sit, safely and securely, even on a slick driveway. You might even get it the same day you call. Questions about winter dumpster rentals? Give us a call or contact us online and we will be happy to answer any and all questions you may have! Smash!! Going to recommend it to everyone!! Incredible service and great staff support and gracefulness! You all should try them atleast once! Recommended to everyone!